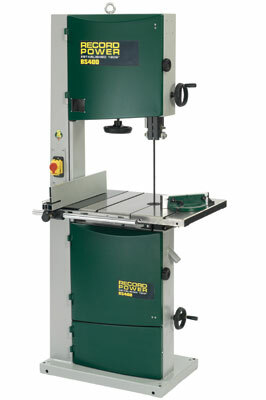 The bandsaw comes with a cast iron table, 110mm high fence and mitre guide. The cast iron wheels are dynamically balanced for vibration-free operation. One nice feature is the blade tensioner cam lever. The blade can be de-tensioned by throwing the lever and re-tensioned by throwing it back to the tensioned position. 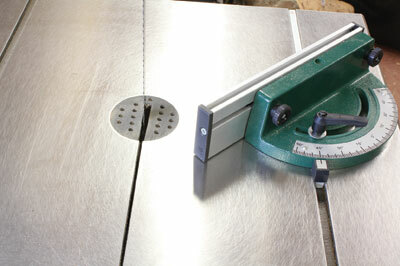 This also helps speed up blade changes if a similar blade to the one being removed is being fitted. The BS400 is the largest of the Record Power range but still within the capabilities of the standard domestic 13 amp supply. 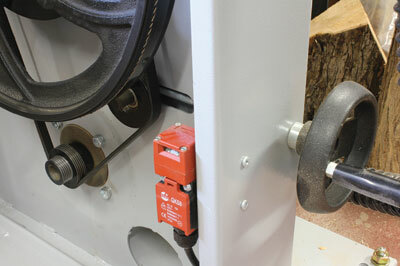 Both upper and lower wheel doors have interlock switches to prevent operation of the saw while any of the doors are open. 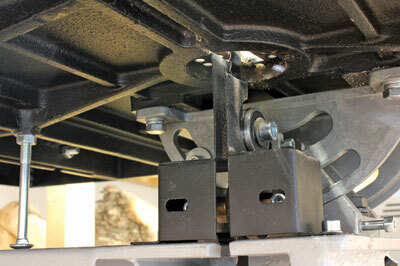 The table tilt is operated with a rack and pinion for ease of adjustment. I watched the accompanying DVD and saw the bit about adjusting the stop screw for the table tilt, and the penny dropped - that is what the bolt was for! The hand wheels for adjusting the belt tension, guide height and belt tension were all easy to use and much better than a small knob. 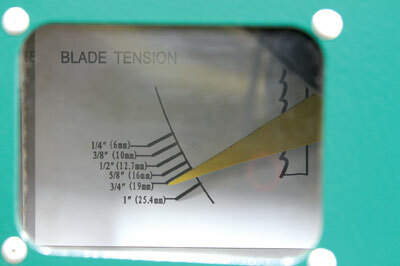 The window in the top door showing the blade tension indicator for different widths of blade is also a useful feature. Both upper and lower blade guides feature a pair of roller guides and a thrust bearing. It was relatively easy to adjust the upper guides but the lower guides were awkward to get to with the blade guards in place. 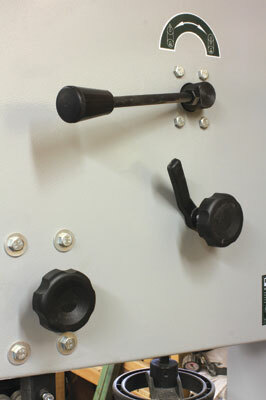 The locking screw for the lower thrust bearing adjustment was difficult to loosen with the standard Allen key supplied. Perhaps a longer handled Allen key would make this easier. 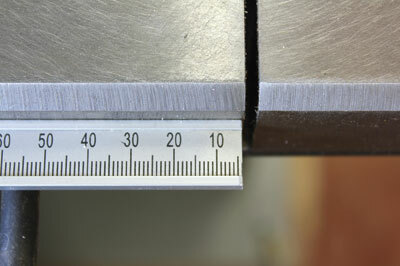 One interesting anomaly was that the ruler scale started at 4mm instead of zero. I checked with Record to see if this was a fault and their reply was that this is how they are made. I was also told this was to make allowance for the set on a coarse pitch blade but I am afraid that did not make a lot of sense to me, as the coarsest pitch blade I could find still only had a set of less than 1mm each side. I am assuming the 4mm start was because the zero reference was taken to be the side of the blade opposite the fence and the first 4mm of ruler scale was missing because otherwise it would have covered the blade removal slot on the saw table. I found it a little disconcerting to have to add 4mm to all my measurements to allow for the ruler scale so I bought a stick on scale which started at zero and stuck that one on myself! This allowed me to use the ruler scale to measure the thickness of wood I was cutting off so in my view, a much more useful arrangement. Once all the setting up was done, I put the saw to use. 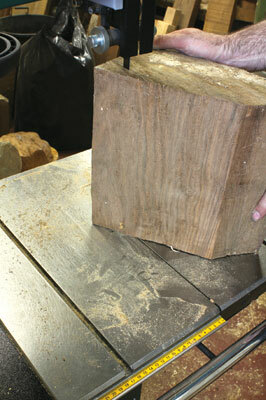 The mitre guide slid very freely and was a useful aid to cutting square ends. The saw seemed to have plenty of power and cut the wood with ease. 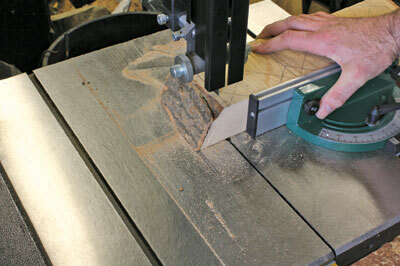 I tried a rip cut with a 255mm deep bowl blank and the saw cut through it with relative ease. The 305mm depth of cut makes this an ideal saw for the hobby user who needs to process slightly larger blanks and the 2hp motor provides plenty of power for the blade. 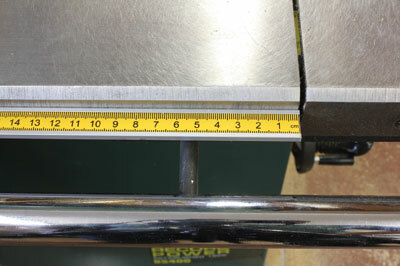 The problem with the ruler scale, although only a minor issue, was a little baffling. When using the mitre fence it is apparent that it does not really come that close to the blade even when at 90 degrees and when at 45 degrees the gap is considerable so it would be useful if the guide was around 80mm longer to allow for this.